Saturday July 18, 2009 was the most amazing day ever! Little did i know that hiking Mt. 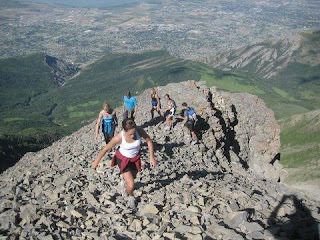 Timp would be a life changing event in more ways than one. First of all it was quite an accomplishment for me to make it up the mountain and back down considering i am not a hiker and second I GOT ENGAGED! I was not extremely excited to go and i was a little nervous but it was definitely worth it. After a few hours of hiking we had reached the sattle of Mt. Timp which was one of the most breath taking view i have ever seen. We had stopped for a little break and some lunch while getting ready to finish our final climb to the top. Me and Roman decided to explore a little bit so we followed a little path and walked around a point not to far away to see what was on the other side. As we were standing there talking, looking at the view i realized Roman had bent down. At first i had no clue what was going on, i asked him what was wrong and why he was kneeling down i just thought he must be tired or something was hurt... i finally realized what was going on because of the expression on his face and a little black box in his hand. I knew he had something important to tell me and i couldnt wait to hear it. I could tell that he was a little nervous and i knew what was coming at that point so i bent down a gave him a kiss before he could even ask me "Shaley i love you and i want to spend the rest of my life with you, will you marry me" came out of him mouth, i said "yes, of course" and i flew into his arms. I was completely surprised and had no clue that he was going to propose. I feel like the luckiest girl in the world and i am so excited to marry Roman. Things could not be more perfect and we are so grateful that we found each other. Yay I love that you wrote out the story! So happy for you guys and your ring just keeps looking prettier! Hey Shaley, this is Ashley Garrett. I found your blog from Lindey's. 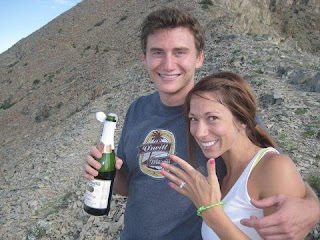 Congrats on the engagement, thats so exciting! Yay!!! I am so happy for you :) Roman is a lucky guy! You look so happy and beautiful as ever! Congrats! You 2 seriously are sooooo cute! You even LOOK like you go together perfectly! Was he the one you were at Vegas with then? When we saw each other?? Crazy! That must be a magical place since I married the guy I was there with and now you are! :) :) Im soooo excited for you!!! I just found ya'lls blog. Such a sweet story. I just know Roman will be a great husband and you both will love married life. We'll have to play sometime soon and go on a double date. Congrats! And if I were to hike Mt.Timp that would be a MAJOR accomplishment. I'm with you on that. Braden is a hiker...I'm working on it. :) So nice to meet you at the shower. You're adorable. Excited to see ya'll again at your wedding.